Shane Heinemeier and Alison Ward left Flux in January to begin a non-profit arts and agricultural project titled Habitable Spaces in Kingsbury, Texas. 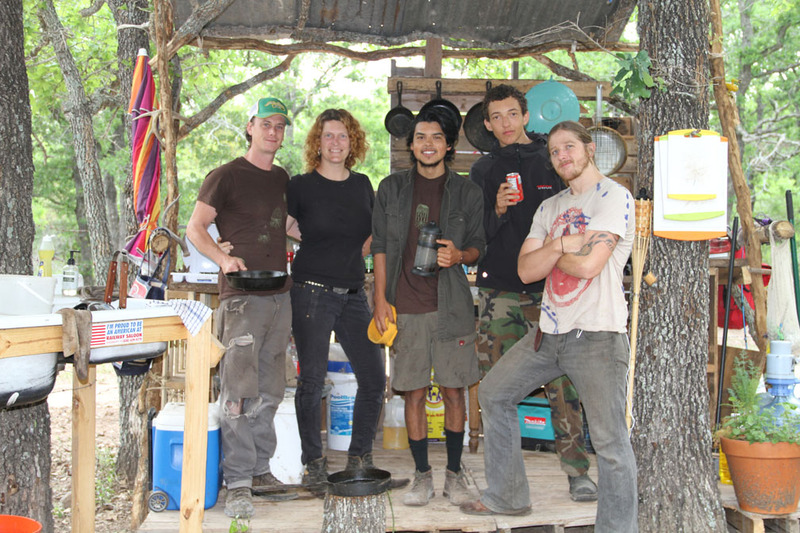 Their goal is to build a sustainable farm and artist residency program that will act as a trading post, research outpost, and an experiment in collective living that will include public hands-on training sessions. They hope to be ready to receive their first artists in September, 2012. Habitable Spaces has just launched a Kickstarter campaign to fund the construction of a kitchen pavilion. Hannah Heilmann is curating a group show in Copenhagen titled Prune in the Sky at Toves Galleri Contemporary Workout Space that opens April 13th, and includes works by Wieteke Heldens (Netherlands), Anna Lundh (Sweden) and Matthew-Robin Nye (Canada). Meg Keys has been accepted to Seniors Partnering with Artists Citywide (SPARC), a community arts engagement that places artists-in-residence at senior centers across the five boroughs of NYC. Chen Tamir is co-curating a group show titled Emotional Blackmail with Markús Þór Andrésson at the Kitchener-Waterloo Art Gallery in Kitchener, Ontario. The show is open from May 9th – July 8th, 2012. Douglas Paulson and the Parfyme crew will be re-imagining and re-filming King Kong in the Tingbjerg community. It’s part of the Visit Tingbjerg project that’s happening in Copenhagen this May. There’s a very dubious posting on wikipedia about Tingjberg. Katrina Neumann has just been awarded a Master of Fine Arts Diploma through Tufts University in collaboration with The School of the Museum of Fine Arts. She will be taking residence at the Elsewhere Collective from May to June. Janne Höltermann is the Luther Gregg Sullivan Visiting Artist at Wesleyan University in Middletown, CT, and is currently teaching courses in Digital Media. Angela Washko is one of four recipients of the 2012-2013 Terminal Award, granted to specific projects in new media and internet based art. She will have a solo exhibition at Terminal: Austing Peay State University Gallery in Clarksville, TN to present her new work The Founding of the ‘Council on Gender Sensitivity and Behavioral Awareness’ in World of Warcraft, time TBA. In May 2012, she is participating in LEVEL at The Arts Center for the Capital Region. Tom Watson will be in residence at the Universidad Nacional de Colombia at their campus in Medellin from mid-April to mid-May. He plans to document and work in response to the practices to the inhabitants of the Moravia neighborhood, who sustain the community by recuperating recyclable materials from the municipal dump.